Our app, ChartNotes, provides an easy way to share medical chart information, such as your medical history, with the healthcare providers. The user would use a QR Code to share their information. 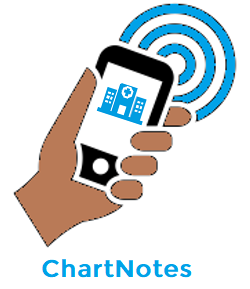 ChartNotes also includes additional features, such as storing insurance cards and connecting with family, to facilitate the interaction between the patient and the healthcare providers. We worked with Allscripts, a company that focuses on "building open, connected communities of health" (about Allscripts). Allscripts is making "for healthier patients, populations and communities" by enriching the healthcare society with more accessible health data information, all while keeping the patients and the providers in mind as the users when designing their beautiful software. ChartNotes did not stem from any of Allscripts projects - instead the Allscripts team in North Raleigh kindly worked with us as we designed our own project, attempting to resolve a problem in healthcare. We got to work with an awesome team of UX Designers and Researchers from Allscripts.